January 4, 2014 in Lumberton NC at the Lumberton Indoor Flea Market will be the Fall-Out shelter from "Homecoming"! RWC is going to start this year off with a bang! The 1st match is a RWC Grudge match. The Native American, Tatanka shared some secrets to the up and coming RWC superstar, Krazyhorse. Krazyhorse will be taking on the back-stabbing turn-coat, Diego Vazquez! Vazquez interfered last month in the main event, Krazyhorse stepped up and foiled the plan. This match has some steam behind it already! Fabulous Ladies of Wrestling return with two of the baddest ladies on the planet! Mia Svensson who has made RWC her home recently, wants to be the Queen of RWC. D'Arcy Dixon has scored 1 victory over Mia. Can she do it again? Bragging rights are on the line in this match! Who will be the Queen of RWC? Mia or D'Arcy? Be ringside to find out. The Main Event will see the return of The RWC World Heavyweight Champion, Hector Sanchez taking on the #1 contender James Anthony. This is how it is done ladies and gents. 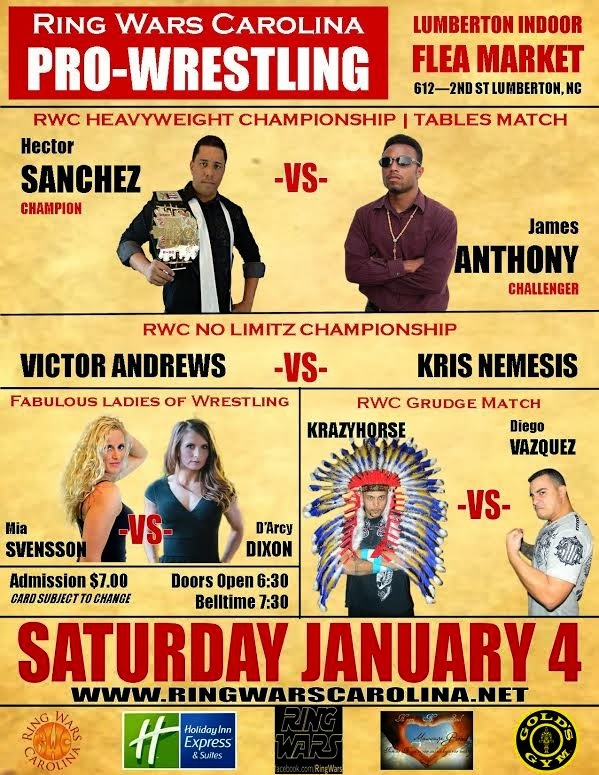 James Anthony has truly earned his title shot by winning matches left and right in RWC. Hector Sanchez has his work cut out for him on January 4, 2014. Both men are ready to do battle for the RWC Title! Is Hector really ready for a war? We will find out! The question that is on everyone's mind is, Where did the Table come from? RWC Front office is keeping a tight lip on the stipulation. Comments regarding the tables stipulation will come later on this weekend. All that and more RWC Superstars will be on hand. Its RWC, you don't know what or who will appear in RWC! January 4, 2014 in Lumberton NC at the Lumberton Indoor Flea Market will be the Fall-Out shelter from "Homecoming"! RWC is going to turn the hit up in Lumberton NC! Bell time 7:30 pm.